When Ron Popplestone decided to check out hockey at age seven, he took care of it himself. Popplestone, now 57 and a married father of two, said that self reliance and hard work went a long way in his house. “I didn’t know how to take that,” he chuckled. Popplestone’s family moved to Bowsman, a community of 300 that is located just north of Swan River and is 350 kilometres northwest of Brandon, when he was four. He started skating and playing hockey at age seven, with plenty of open ice available at the Bowsman Skating Rink. Popplestone’s parents Barb and Joe would prove to be a huge help with his hockey career, but he began the journey by himself. He registered himself and would carry his equipment to the rink on his own. He started as a defenceman for his first two seasons, and when the team needed a goalie, he strapped on the pads. He played in Bowsman in a league against nearby communities such as such as Swan River, Benito, Minitonas and Birch River until bantam, when the first tryouts began for regional Swan Valley teams. He made the squad, and was pushed by Greg Shaw, his goaltending partner. They also competed in baseball and even badminton, while playing together on volleyball and basketball teams. Former Wheat King Dale Anderson coached Popplestone in his first year of midget, and it was Anderson’s father who mentioned the young goaltender to Don Dietrich, another former Wheat King who was scouting for Brandon. At age 16, he moved to Brandon to join the Travellers in the Manitoba Junior Hockey League for the 1977-78 season. Popplestone, at five-foot-nine and around 160 pounds, wasn’t exactly a giant in a rough-and-tumble era of the game. Popplestone said Menzies was one of the older players who made a point of taking the younger players under his wing and making them feel comfortable. The Travellers would finish with a 34-17-1 record, but were knocked out of the playoffs in the first round by the Dauphin Kings. 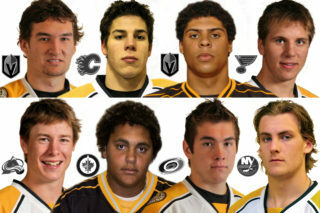 The Travellers were essentially the Wheat Kings’ farm team at the time. Popplestone had been listed and was part of the organization. Popplestone also spent his 17-year-old season with the Travellers in the 1978-79 campaign as the Wheat Kings embarked on their run to the league title with one of the finest squads in WHL history. The Wheat Kings had Rick Knickle and Scott Olson in net, and Popplestone practised with them. 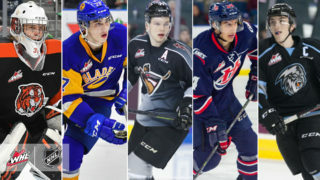 He thought he might be headed to the Memorial Cup too, but instead the Wheat Kings picked up Bart Hunter from the Portland Winter Hawks. 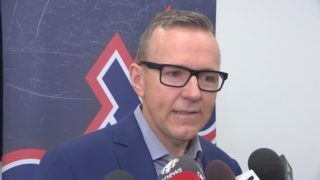 Popplestone said it was a good experience to be facing shots from players like Brian Propp, Ray Allison and Laurie Boschman in practice. “I’d been called up a couple of times throughout the year and the one thing that really got me to know those guys pretty well was when we had a bench-clearing brawl with Saskatoon here in the Keystone,” Popplestone said. Props had been cut by a Blades player, and Wheat Kings defenceman Don Gillen was urging coach Dunc McCallum to let them empty the bench to extract some revenge. McCallum eventually agreed, and the brawl was on. Popplestone squared off against goalie Tom Muc — “I actually hammered the snot out of him” — as his Neelin High School buddies in the crowd urged him on. The police ended up on the ice and they shut off the lights, but the best would come for Popplestone back in the dressing room. Popplestone earned a permanent spot with the Wheat Kings in his 18-year-old season in 1979-80. Even with his previous experience with the team, Popplestone knew he had to play well to stay because Knickle and Olson were still there. Knickle was eventually sent to the Muskegon Mohawks of the International Hockey League, and by the end of the season, Popplestone had earned the top job. He played 34 games, and in a far more wide open era of the game, posted a 5.23 goals-against average and an .880 save percentage. He said he didn’t feel much pressure that season but it escalated in his 19-year-old season in 1980-81. Under new head coach Les Jackson, the Wheat Kings finished 29-40-3 and were eliminated in the first round of the playoffs. Aside from a brief resurgence in 1983-84, a 12-year spell that would see the team make the playoffs just four times had begun. Popplestone hadn’t thought much about being drafted in the National Hockey League, until he saw a mention in the Brandon Sun that he could be selected in the late rounds. The league had changed its rules from a 20-year-old draft to anyone aged 18 to 20 in 1980. It would be the end of the line for Popplestone’s junior hockey career. For the 1981-82 season, the Wheat Kings went with Todd Lumbard and a fiery rookie named Ron Hextall. Popplestone had a chance to join the WHL’s Seattle Breakers when coach Jack Sangster called, but he was tired of hockey and wanted to move on with his life. He now regrets not taking a chance and heading south. He also had a chance to go to camp with the L.A. Kings organization as a walk-on — they liked his standup style — but team owner and GM Jack Brockest said he would find him a spot with one of the teams in Western Canada. It never happened. Popplestone began to think about what would come after hockey in his second season. After he graduated, he took a couple of seasons off to clear his head and worked in Brandon. He joined the Brandon University Bobcats for the 1982-83 season, and after that, he wanted to get on with his life. He had been working with the city in the summers, but got into sales and had a 28-year career with the Murray Auto Group. In a way, Popplestone returned to the Wheat Kings in the late 1990s when he embarked on a 12-year run providing colour on radio broadcasts with the team’s longtime play-by-play announcer Bruce Luebke. It’s been a decade since he called his last game — although he returned to help out Luebke and current colour guy Peter Gerlinger in the 2010 Memorial Cup — and he still runs into people who remember him from being on the radio. 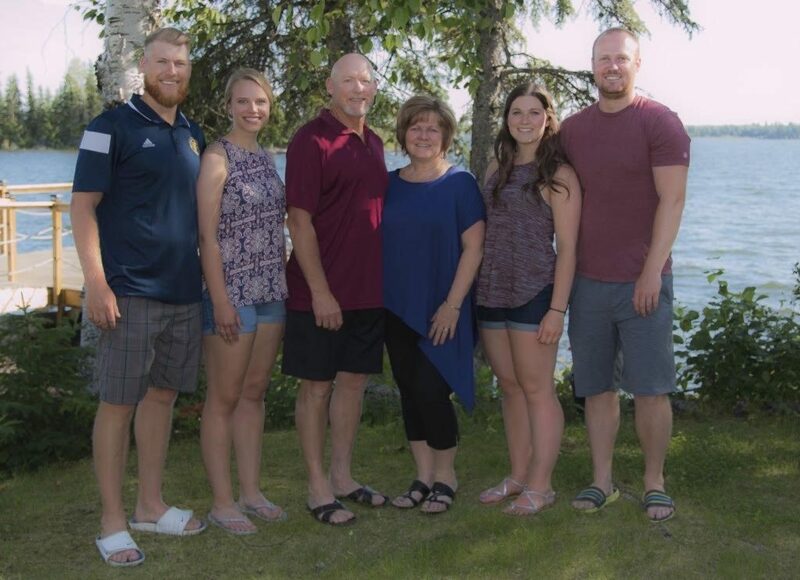 He retired in 2011, and five years ago he and his wife Juliette moved to Rocky Lake, which is located between The Pas and Flin Flon. 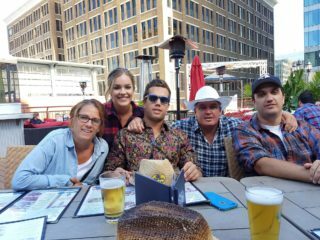 They have two children, Garrett and Laura, each of whom had fine post-secondary careers playing volleyball. Garrett played at Medicine Hat College before transfering to Brandon University, where he won a national silver medal in 2010-11 and a national bronze medal and Canada West conference championship in 2012-13 as a setter. Laura, a libero, started at BU before going to Lakeland College and helping the Rustlers win a Canadian Collegiate Athletic Association championship in 2016-17. Ron Popplestone deals with multiple sclerosis, and has had new hip put in recently. Nevertheless, he said he’s doing well.